Continuing our series of photographic inspiration for writers, which we started on Thursday, here’s the final image, from Flickr user Fran Pregernik. What does this say to you? It had been two months since we said our vows and moved to this small town in North Carolina. Everyone in town had been gearing up for the watermelon festival since we had arrived. The city had cleaned the main street, the art department of the local community college had painted every store window with pictures of watermelons, and banners were strung on every light pole from the interstate all the way to downtown. I had taken a job for the town in the development department. It was my first real job since college. My part in the festival was small, but the energy surrounding the festival had made me excited to have any part of the festival at all. The only thing I had to do was print out a map of the town so that the police department could mark the emergency routes once Main Street was closed. It was small, but it did seem important. My husband, Eddy, had been excited about this little festival until my parents called last week. They were coming up for the weekend for the first time to see us. After the call, Eddy seemed to find a hundred reasons why it was not going to be a good idea to go to the festival. Everything from “it might rain” to “it will be crowded.” At first I found it amusing, now it was just annoying the hell out of me. First his family was way more difficult to deal with than mine and secondly it wasn’t like they were here every weekend. I considered throwing a crying crazy tantrum, but I chose to ignore his negativity. After a massive cleaning spree, I made our one bedroom apartment as nice as it could possibly appear. It would take my parents a little over two hours to get here, but knowing my Dad they would leave before the sun crossed the hills of my mountain home. I expected them by ten o’clock that morning and I wasn’t off by much. They arrived at nine that morning. I guess I miscalculated sunrise. By lunch the apartment seemed to get smaller and smaller, so we loaded up and headed to the festival. Eddy was quiet and I could tell by his face that he was still disappointed that they were even there. My Dad had already coined seven corny jokes and had given him a lecture on how the dead bolt on our apartment door wasn’t securely fastened. My mother had cleaned my kitchen again even though I had just finished only moments before she came. She also had switched all my glasses so that the tops were facing the bottom of the cabinet as she muttered something about dust inside them. Still it was better than when his mother had visited two weeks ago. She brought a cooler full of frozen meals. When I asked him about it later, he just laughed and said that I shouldn’t think too much about it. It was just one of her character quirks. I had every intention of reminding him of that when he started in about my Dad and the dead bolt lock. The festival was everything that it promised to become. The streets were full of antique cars, country music, and freckle faced kids carrying slices of watermelon. We watched the watermelon eating contest where some hippie with a hemp necklace and dreadlocks won and spent a little time at the seed spitting contest where a long and lanky farm boy spit his seed over the mayor’s head. The mayor found it kind of amusing, but my mother didn’t. There were seeds all on the ground and my clean freak mother was trying to pick them up as we went along. Eddy had seemed a little melancholy until he bumped into the watermelon queen. In her tacky red high heels, the bleach blonde had tripped over her own two feet and fell directly into his arms. Her red and black dress barely covered her chest, but I don’t think he minded that. I didn’t speak to him for at least the next twenty minutes. Finally, we heard the last band play and headed back towards the apartment and grabbed a couple of watermelon drinks on our way out. Dad had to make one last stop at the local hardware shop to pick up a better deadbolt. Eddy’s eyes were livid and his head was shaking as we pulled in the parking lot. I just reminded him that it was a character quirk. He observed the scene, lowering his suitcase to the tile, loosening his tie, kicking off his shoes. Not one, but two glasses. Full. No lipstick. No fingerprint smudges. He wondered, Why two? She couldn't possibly have known about the change of plans, his surprise return home early, and yet, somehow, two full glasses of Berry Typhoon, her favorite, not his, were dripping condensation all over the new counter tops. Arms behind his back, he circled the island, surveying the crime scene with careful sniffs, a bloodhound on a mission. The fruity smell almost made him gag. The two glasses were, quite simply, waiting for the party to start. Or the party to end. But what party? He looked around. A thud sounded from upstairs. His wife must be in the bedroom. And the owner of the second glass must be with her. He leaned on the counter and, slowly, carefully, tipped the first glass until the frozen and toxic liquid poured to the floor, and pooled around his socked feet. The glass rolled and shattered. He didn't even flinch. He stared at the second and listened to more panicked thuds upstairs. Footsteps echoed on the hardwood floor. He smiled and tipped the second helping of Berry Typhoon until it, too, shattered at his feet. A voice, "Mr. Robinson? Is that you?" He turned. He frowned. He rubbed his bleary and jet-lagged eyes. "Mr. Robinson, are you okay? Should I call your wife?" A woman, red-haired and fat, held a silk robe tight around her waist as a balding man in a blue robe placed his hands on her shoulders. "It's okay, dear. It's just Jack again." The woman whispered, "I should call his wife." "That's not a very good idea," the balding man said, coughing. "Jack, my good man, I will drive you home." Jack sniffed. He shook his head. "This is my home. What are you doing in my home?" he screamed. "Where's my wife?" The balding man sighed. "You don't live here anymore, Jack. Remember? You moved after the divorce. Come on, now. I'll be taking you home." Jack stepped forward and a shard of glass sliced his sole. His blood mixed with the berry drink on the floor. He felt a hand on his shoulder, picking him up, dragging him out, and he missed her so bad, if only she would come back to him, they could drink together, a pair. "You see that Albert?" Jim said as he squinted through one eye at the two glasses of thick red liquid sitting on the table. "Yah, it looks pretty bad," Albert replied. "It doesn't look too good does it?" Jim said as he moved his head back and forth trying to see from different angles. "no it sure doesn't." Albert came over and sat down and stared at the two glasses. "The guy behind the bar says it's good for a hangover, says it will fix us right up," Jim said as he looked over at his friend looking for a concurrence. "Will it now? Well we've got the hangover all right." "Yah, and the shakes are setting in." Jim replied gripping the table to steady himself. I need something to help tame them." "You think that will do it? It doesn't look to good and it's red." "I think I'm going to die," said Jim. "Hell of a night, wasn't it, one to remember. That old Wild Turkey's sure goa a kick doesn't it?" "Where did you get the money Albert? We don't usually drink that good. Is there any left? That's what will fix the shakes for me, some more of that Wild Turkey," Jim said as he looked at his friend in hopeful anticipation. "Can't say there is Jim. If there was we wouldn't be looking at this stuff now would we?" "I think I'm going to die," Jim repeated. "I made some money sweeping floors over at Andy's Pub, over on Sixth Street," Albert said. "You worked. It a long time since I knowed you to work." "It was only for a little while, just long enough to get that bottle. "Last night you said we were celebrating. What were we celebrating Albert?" "me working of course. It's been some time since I worked." "Oh yah, I remember now. God Albert I'm sick. I think I'm going to die." "The fellow says this stuff will fix you right up." "What do you think is in those things," Jim asked glaring at the glasses. "They look pretty bad." "I don't know. The guy just said they would be good for us." "It probably has an egg in it. I hate eggs. Hangover cures always have eggs in them. Probably some Tobasco Sauce too. I'll have heartburn all day." "You want to feel better Jim? You'll have to drink up." "Some more of that Wild Turkey would make me feel better. It's good for the shakes," Jim said still in hopeful anticipation. "The Wild Turkey is gone. You'll just have to drink this." "It looks awful. How can anything good look that awful. And it's red." Drink it Jim. It will do you good." "I can't do it. I just can't." "Sure you can. Hold your nose and down the hatch. Now that's a good boy," Albert said as he held the glass for the other man. "Gods that's terrible," coughed Jim as he doubled over holding his stomach. "It's worse than the hangover." "You're a brave man Jim." Aren't you going to drink yours?" asked Jim as she saw his friend push back away from the table and get up. "Me, drink that? Hell no. It looks terrible and it's red. I couldn't drink that." “What the hell is in that thing?” Lily said, sputtering the words out between coughs. Her smarting eyes watered; her throat burned in defiance of the ice in the drink she’d just tasted. “It’s a smoothie for grown ups. Drink it.” Claire threw her own drink back and guzzled it down in one go. With her head tilted back and eyes on the ceiling, she missed the gorgeous man moving nearer- only steps away now. He was tugging at his tie to straighten it with one hand and dragging the other back through slicked-down curls, running through his opening line in his head for the tenth time as he approached. One look at the way she sucked the beverage dry- an Oreck combing deep pile- and he veered off. She obviously had a lot of experience at it. With no way to avoid overhearing, the buttoned-down blond man standing closest to Claire at the bar now blinked. His mouth fell open but only for an instant. He considered responding but instantly thought better of it. Instead he shook his head, dropped some money on the bar, and decided to go home to his wife. At least she didn’t ever call him a mama’s boy. Sophie lay in the grass. The blades tickled her neck, her cheek. She smelled baked earth, hot grass recently mowed. “I’ve been waiting for this,” she said, stretching her bare arms over her head. “You look like a cat,” Darren said with a short laugh. He sprawled in a lawn chair several feet away, the backyard king, his knees apart, his elbows resting on the molded plastic chair arms, his big feet knobby and shoeless. She could see the sweat glistening on his calves. There was a shadow over his face from the big umbrella. Mrs. Nielsen appeared around the corner of the house, carrying a tray, blinding silver in the sunlight. Sophie thought she spied smoothies. Her parched throat tickled and she sat up. “Here you go, kids,” Mrs. Nielsen said, setting the tray down next to Darren’s elbow. She was wearing a white turban, like a Sikh guru. Her pale hair hung in wisps down the sides of her face. “Nice to be done,” she said, more of a statement than a question. A smoothie caused my parents’ divorce. Okay, I’m exaggerating. The smoothie was probably just the coup de grace in their volatile relationship, the straw that broke the wheatgrass-fed camel’s back. From what I could gather from old photo albums, my parents had always been total opposites. There was the picture from our family cruise, my mom sticky from a run around the track and my dad bloated after several laps around the buffet. There was the one from the club, my mom posed with a tennis racket over her shoulder and my dad with a drink in one hand and a cigar in the other. And let’s not forget my favorite, the one from Thanksgiving, my mom popping the Tofurkey into the oven and my dad looking like his head was about to explode. My mom had spent years trying to get my dad to exercise, eat better and give up the alcohol and tobacco. What started off as friendly suggestions turned into pleading requests turned into pointed ultimatums turned into two raspberry smoothies being slammed down onto the kitchen table one Saturday morning. There was a lot of yelling, some crying, a little bit of cursing, and the next day my parents announced they were getting a divorce. I probably should have been a little more upset, but honestly, it seems like they were the only ones who hadn’t seen this coming. I’d been preparing for years. And thus I figured it was high time I actually decided which parent I wanted to live with. I’d been hypothetically choosing one parent over the other my whole childhood. I always assumed that had I ever found a golden ticket in a Wonka Bar and had to pick one to take me to the chocolate factory, my dad would be the clear winner. But the all-access passes to Wimbledon I hoped would miraculously fall into my lap? It was my mom every time. Choosing which parent to live with was a bit more difficult. On the one hand, my mom had given birth to me, always nurtured and supported me. But on the other, I was a fifteen-year-old boy. A boy needs his dad during these difficult years. And cheeseburgers. My mom would have a coronary if she caught me with one of those, so I decided right then and there that I would live with my dad. I hopped down the steps to tell him the good news and began fantasizing about our life as two bachelors out on the town. Perhaps we’d get a place in the city, a loft in the design district or a two-bedroom in a high-rise overlooking the bay. I imagined us going out to dinner every night, then hitting up the neighborhood bar on the way home. We’d make friends with the bartender, Joe. His name would most certainly be Joe. Every night, Joe would pour my dad a double scotch and slide me a Sprite. “Hey now, Joe,” my dad would say, “lean on that a little bit for my boy, would ya?” And then Joe would glance around to make sure no one was watching, then grab one of the bottles off the top shelf and pour a small swig of liquor into my drink. My dad would turn to me and wink. His car was idling in the driveway, and I hopped into the passenger seat. He shifted into reverse and looked at me for a brief moment as the car was backing into the road. “You’re living with your mother,” he said as he threw it into drive. He didn’t say a single word to me during the entire five mile trip to my school. As each block whizzed by, so too did my dreams of bachelorhood, condominiums, speakeasies and other very long words. Three weeks later, my dad moved in with his paralegal. In hindsight, perhaps I was a wee bit quick to condemn the smoothie. The last of the evidence crunched in the disposal when he walked into the kitchen. I quickly pushed the remainder of the rat tail down the drain with a spoon before he could see. "Hey," I greeted while turning and glancing left, then right, to make sure I hadn't left any bits of bone, teeth or hair laying around. "Hmmm." He eyed the concoction in the blender. "That looks good." 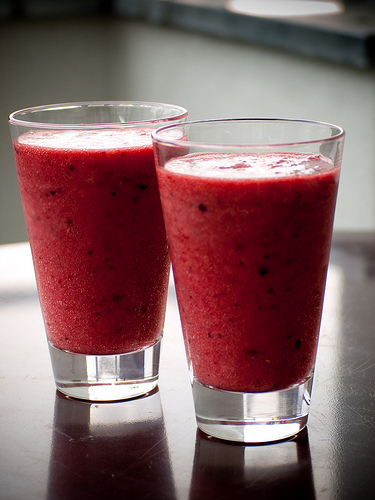 "I hope you like smoothies." I smiled. "What kind is it? Berry?" He pulled himself up onto on the stool on the other side of the counter. "Yeah, something like that." I had to hold my breath to keep a laugh from escaping. I pulled out the good glasses, the ones my parents only used for special occasions. This was definitely a special occasion. Today I would find out if my best friend really understood me, really got me like he seemed to. All the others had run away the first time I tested them. None of them could handle the kill of the first cat. But Jacob was different. Even after the dog, he didn't run. This is the one. My first true friend. That is, if he passed this last test. I had really wanted a cat for this, but I couldn't find one. I think we'd scared them all away, or killed them all. The rat I found was almost big enough to be a cat though. But the taste wouldn't be quite the same. "Here ya go." I slid a glass over to Jacob, admiring my work sloshing around inside. It really did look like a berry smoothie. The cockroach bits resembled blended blueberries and the ice lightened up the color of the blood to a nice strawberry shade. I could hardly wait to taste it myself. I picked up my glass, gesturing for him to follow. "Bottoms up." I watched him over the brim, waiting, wondering if I had underestimated my friend. He took a long, slow sip, and set the glass back down on the counter top. His expression was unreadable and blank. Then he spoke. "Have you ever tried ferret? Now that makes a good drink." Samantha hadn’t bothered to throw crusty glares at the people staring at her for at least fifteen minutes. She could still hear them whispering to their friends wondering why she looked so terrible. She knew her eye makeup had made it to her chin. She and her brother’s hot pink smoothies lay untouched on their little round rot iron table. Samantha listened to the story that her brother read for what had to be the hundredth time, yet, she still felt fresh tears as he read. “It’s been twenty-five years since my first trek through the United States of America. There are still places that I remember as if they were yesterday. One such place was a small camp nestled in a valley a few miles outside of Buena Vista, Colorado. I was in my forties and feeling every year of it at that high altitude. I was visiting the camp on my way to San Francisco. But, I have to admit, the lack of oxygen got the better of this Aussie lowlander. I’m not sure why, but the psychopathic part of my brain agreed to climb a ‘fourteener’ on my third day at camp. For those of you who read my little newspaper and don’t know what a fourteener is, let me take a moment to explain. You see, the valleys in the Rocky Mountains are at ten thousand feet by U.S. measurements. A fourteener is a mountain that is fourteen thousand feet above sea level. So, many of you will understand why alarms were going off in my head about a third of the way up the mountain on my little hike. Admitting defeat at our first water break, I told the head counselor that I could go no farther. A smiling plump woman who had been on the disastrous white water rafting fiasco only the day before where my fingers actually went blue, plopped down next to me. Wyatt stopped and Samantha looked up to see what was wrong. “Are you okay Sam?” He asked. Samantha could see the tears welling up in Wyatt’s eyes. “Yeah, I’m okay. I remember that Australian woman. I just wish mom would have talked to us about this. Ya, know? Keep reading please.” Samantha urged. “I know what you mean.” Wyatt said as he rubbed his eyes under his glasses. The pair sat at the table staring at the pools of water that had formed under their completely melted drinks. Samantha thought about her mother’s words coming all of the way from Australia the day after she died. The Australian woman said in her news letter that she hadn’t seen or talked to Samantha’s mom in over twenty-five years. Samantha sighed. It was exactly what she needed to hear at the perfect moment. It didn’t make her mother’s death easier. It just tempered the agony a little. “What do you want in yours?” Sam asked pulling out the blender. “Surprise me,” I smiled taking in the homey kitchen with its collection of roosters and the paraphernalia on the fridge. The large bay window had a perfect view of the backyard. If things kept going this well, he’d invite me to hang out in their pool over the summer. The machine whirred as I walked through the living room studying the family portraits that lined the wall. “You must be Cassie,” Sam’s mom startled me. “Yep. You have a lovely home Mrs. Quartz,” I turned to face her. “Call me Lori,” she insisted. I smiled unsure what to say. There was no way I was going to start calling her Lori. Awkward. “So…uh, I’m guessing this is Sam as a baby,” I pointed to the photo in front of me. “Isn’t he just darling?” Lori got her baby voice on. “He looks a lot like you,” I pointed out. I feigned interest at each picture as she told me story after story. I was ready for Sam to come back with my drink. We flipped through the book until we got to potty training pictures that I so did not want to see. Sam walked into the living room with two large smoothies. “I’m sure she’s seen enough, we’re going to watch a movie now,” Sam walked towards his mom, shut the scrapbook and wedged his way in between us. I didn’t mind his knee touching mine or the mischievous look in his eye. “Fine, fine I can take a hint,” she got up and walked to the kitchen. Sam smiled and handed me the smoothie. I sipped the berry colored concoction. “This is so good!” I said. “And what else? There’s something else,” I took a swig. “It’s something else, with the texture…like coconut,” I felt the little string like things tickle down my throat. “Sam, did you wash those blue berries?” Lori called from the kitchen. “That’s not the problem.” Lori came into the living room with the rest of the blue berries. She held the container down in front of us. I looked in the plastic box and then back in my cup, to see the same little green worms hanging out in both. I didn’t make it to the kitchen sink in time. Jody thought about putting the drinks in the pockets of her cardigan before leaving the room but changed her mind. She wasn't doing anything she should be ashamed of. Making her child eat, by hook or by crook, was part of the mother's creed, cross-stitched onto a sampler by her own mother while they were both waiting for Mandy's arrival. Jody squared her shoulders, picked the two glasses up and walked as fast as she could towards the stairs. She was almost there when she heard her husband's voice. "I made an afternoon snack for our daughter." "How many cups do you have?" "Two. You caught me. I'm going to share with her. I know I'm fudging on my diet a little but that's between me and my scale." Wes loomed over her and took the glasses from her shaking hands. He sniffed the contents. "Is that strawberry I smell?" "Yes, strawberry and some other berries. Those are going to melt if we stand here all day. Please give them back." "Strawberries, some other berries and what else?" "Ice cream. The usual." Her hands were shaking so badly now that they hurt. She shoved them into her pockets, trying to still them. "I can fix you one if you want." He smirked at her. "I'll have these. You can make some more." "No, you can't do that." "No treats for your poor hardworking husband?" "Stop it. I hate it when you act like this. You win. You can't have them because I put blood in them. She won't drink them if I don't." Jody grabbed the drinks back from her husband and rushed up the stairs. She was pretty sure he wouldn't actually hurt her and she had to feed her starving daughter. Wes came clumping up after her, like a monster in a movie. Slow and steady would win him this race. Step. Step. Step. "You promised the doctor you wouldn't feed this obsession of hers. If we play into it she'll never get better." "If we don't she'll starve to death. Have you really looked at her lately?" Jody didn't like to admit it but her daughter really did look like a vampire. She was all pale skin, long teeth and skinny as you'd expect something that slept in a coffin to be. "Besides, I mixed it with ice cream. She's not getting pure blood. If she drinks this and keeps it down we can keep diluting the blood until she's back to normal." "She'll never be normal if we keep giving into her." "Because she'll be dead." She turned and faced her husband. "Let me try it my way. Just until she's strong enough to try it your way. Please." Wes sighed. "All right. We'll give it to her. But let me do it." He opened the door to their daughter's room and set the cups down on the table in the middle of the room. "Mom made you something to eat. It's got your special ingredient." The closet door creaked open and Mandy peered out. She looked even worse than the day before. Wes yanked the curtains open so the light shone on the table. "Here you go. You can come into the light and have your blood or you can eat something normal, like a normal girl." Mandy screamed and flew out of the closet, knocking Wes into the corner. She battened onto his shoulder, bit into his neck and started drinking, making the same happy noises she made when she drank as an infant. Jody sighed. "I told to let me do it my way but you never listen."